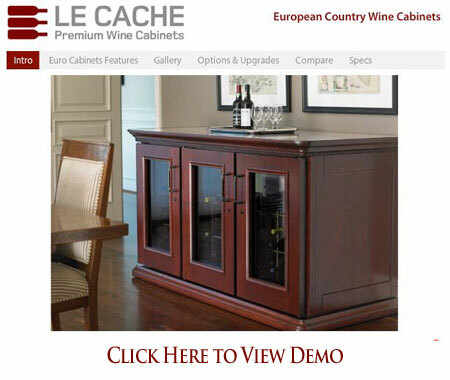 Le Cache Euro 2400 Wine Cabinet Chocolate Cherry (P/N 747). Designed by acclaimed, Pinnacle Award-winning designer Martin de Blois, our European Country Series wine cabinets evoke the timeless elegance of European furnishings. Architectural details such as crown and base molding, paneled sides, hardwood French doors and hand-carved accents showcase fine wine collections with a sense of luxury and style. Sealed seams, premium insulation and tinted double-paned glass provide thermal and UV protection.These options are included in the price of your wine cabinet. I was tired of bending down into the 2 cheap mini wine captains that hold about 30 bottles each and saw this model at a B&B in Healdsburg, CA and fell in love. Now instead of worrying about which wine to leave out of the cooler, I'm looking to see what deals I can get to fill this unit up. It's a very nice compliment to our existing furniture. So much that it is like a nice piece of furniture. Ben and the guys at La Cache rock! I have recommended to all my wine-o friends as well. The cabinet arrived safe and sound just before Christmas. Setup was easy and the delivery co. did a good job. I have had it operating for the last 2 weeks and it is working perfectly. Since the cabinet was a 2nd....it really exceeded our expectations. The finish and workmanship is exceptional. We received the wine cabinet and are enjoying it very much. The installers did a great job of putting it together, and wow, were they fast. They did bring to our attention that their was some scratches/dents in the rear of the cabinet from the shipping process. We looked at them before installation, and felt they were not a big deal. The cabinet looks great and works wonderfully. We congratulate your company on a great product.